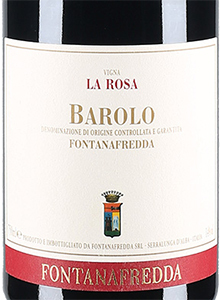 The barolo 'Vigna La Rosa' by Fontanafredda is produced in vineyards located in the Langhe hills, in the heart of Piedmont. 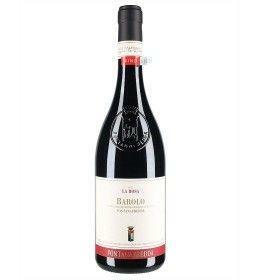 It is made from pure Nebbiolo grapes, picked and selected only by hand. The wine is aged for 24 months in cask and for another 18 months in bottle. Perfect with red meat and medium or long seasoned cheeses, ideal as a meditation wine. THE WINE The barolo ' Vigna La Rosa ' by Fontanafredda is produced in vineyards located in the Langhe hills, in the heart of Piedmont. It is made from pure Nebbiolo grapes, picked and selected only by hand. The wine is aged for 24 months in cask and for another 18 months in bottle. Perfect with red meat and medium or long seasoned cheeses, ideal as a meditation wine. THE COMPANY Fontanafredda is a historic winery immersed in the fascinating hills of the Langhe, born from the estates of Roggeri Giacomo in Serralunga d'Alba, registered in the private patrimony of Vittorio Emanuele II, King of Sardinia, in 1858. However, Emanuele Guerrieri Conte di Mirafiore, son of the king , starting the business, twenty years later, in 1878, thanks to his strong passion, spirit of initiative and foresight. Today Fontanafredda has about 122 hectares, of which 84 are cultivated in vineyards and divided among the most prestigious municipalities in the Barolo area: Serralunga d'Alba, Barolo and Diano d'Alba. The estate is also formed by the historic cellars, the Villa Reale and a large nature reserve. Today Fontanafredda belongs to the association Vino Libero, a group of 12 wine producers and 1 distillery, united by the intention of developing sustainable agriculture, combined with a continuous research process aimed at preserving nature and minimizing intervention in the vineyard and in the winery: the latest experiments by Fontanafredda are aimed at limiting the use of sulfur dioxide. The winery's vineyards live in a lively and varied ecosystem, the soils are processed with controlled ripening techniques, without the use of chemical fertilizers and herbicides, but only of organic substances. 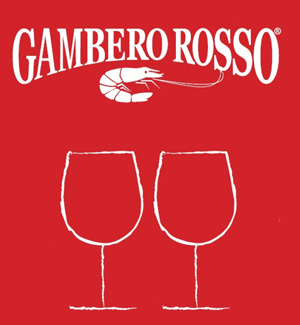 A company that still continues to make the history of Piedmont. Before 75,00 € tax incl. Tasting Color: intense ruby red with garnet reflections. Bouquet: wide and intense floral scents of dried rose and violet, notes of tobacco and vanilla and hints of undergrowth. Taste: soft and velvety, thick tannins and balanced finish.